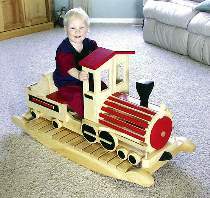 Your child can be the engineer on his or her own train. Designed for 2 to 4 year olds. Make from standard 3/4" and 1-1/2" stock. Measures 43"L x 21"H x 13"W. Plans drawn FULL SIZE.